This relatively hard defence blade was built for a modern defensive game. The blade head is a little bit bigger than the norm. 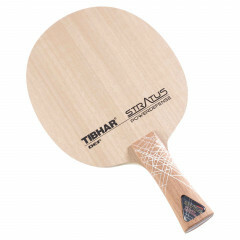 This light-weight wood will enable the player to react fast to almost his entire adversary's strokes, putting him under pressure, no matter where the player is situated at the table. Tibhar Blade Stratus Power Defense is beeing added to cart.